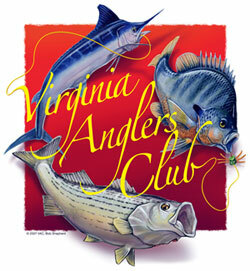 The Virginia Anglers Club (VAC) is based in Richmond, VA, and has been serving our member anglers both near and far since 1961. The VAC is affiliated as a club with the IGFA and the CCA of Virginia and is incorporated in the Commonwealth of Virginia as a not-for-profit corporation. The Mission of the VAC is to honor the traditions on which the club was founded and to provide the anglers of Virginia with various opportunities to foster their passion, knowledge, and skills of fishing. The VAC champions responsible and ethical angling practices and makes annual monetary contributions to various organizations whose work is dedicated to enhancing the angling environment through conservation and legislation. The VAC seeks to create various fishing opportunities for members to experience by hosting annual club tournaments and non-tournament expeditions. Each event encourages members to become better anglers by targeting different species in different bodies of water with the option to use various types of tackle. The VAC provides opportunities to learn and share knowledge about fishing both locally and internationally. Each monthly membership meeting features guest speakers or club members who are considered experts in their specific area of fishing or who represent an organization whose focus is to conserve and enhance the health of our coastal and inland fisheries.